Shungite has numerous protective and healing properties. People of all ages and nationalities all over the world have shungite items to ensure comprehensive personal protection in your daily life. One of the most popular protective shungite items is shungite jewelry, namely shungite pendants or amulets, known for attractive black color and a variety of shapes and sizes. Shungite pendants are definitely among the bestselling shungite products on the market. Alongside with being trendy accessories they are ready to shield you from any damaging influence of the outside world including electro-magnetic frequency (EMF), geopathic stress, the evil eye and so on. Real shungite pendant is able to turn any negative energy into the positive one and balance energy flows bringing calm and stability into your life. Protective shungite pendants or charms are root chakra pendants. They clean and charge the Root chakra of the owner improving his mood and health. If you wear protective shungite pendant on a daily basis, you contribute to your health and overall performance. Due to the close location to the neck and heart, pendants made of shungite have major positive impact on cardiovascular system; improve the blood circulation, functioning of the immune and some other internal systems of your body. What is more, shungite pendants are believed to increase memory capacity and overall productivity. Nowadays the number of people living under pressure and working hard in office hustle or even in extreme conditions is increasing. Therefore, Karelian Heritage experts are sure that today shungite pendant is a must-have shungite item for everyone who wants to be successful, but is responsible for his own health at the same time. Since regular shungite stones can be easily shaped and polished, there is a variety of shungite pendants of different shapes. You will definitely find the one to satisfy your demands and meet your preferences. 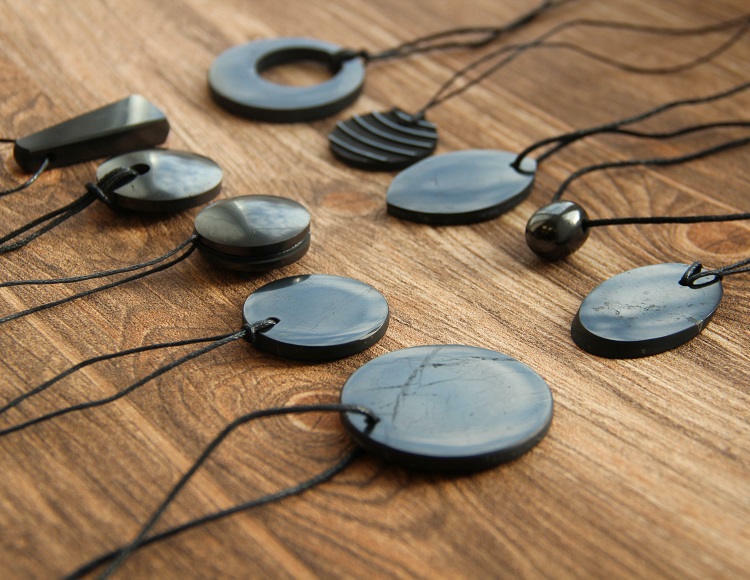 One of the most popular type of pendants is circle- and oval-shaped shungite pendants carefully polished by Karelian masters. Rounded shapes are considered to enhance protective and curative properties of shungite because they are associated with harmony, stability and protection as well the mineral itself. Circles and ovals have no beginning and end. 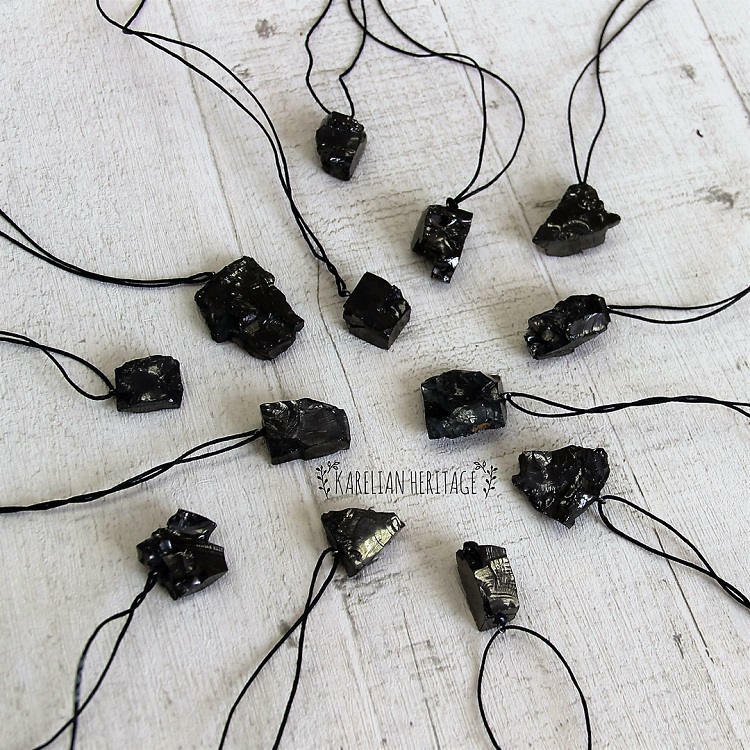 They symbolize continuity, unity and integrity and are believed to represent the life and lifecycle while shungite is known as the stone of life. In other words, round or oval shungite pendant is an ideal combination of material and shape. At our website, you will find various round shaped shungite pendants of different size with some additional design to meet the demands of all sophisticated customers. If you need even more powerful protection, you may like our handmade elite shungite pendants. They are made of elite nuggets of different sizes in their original shape. 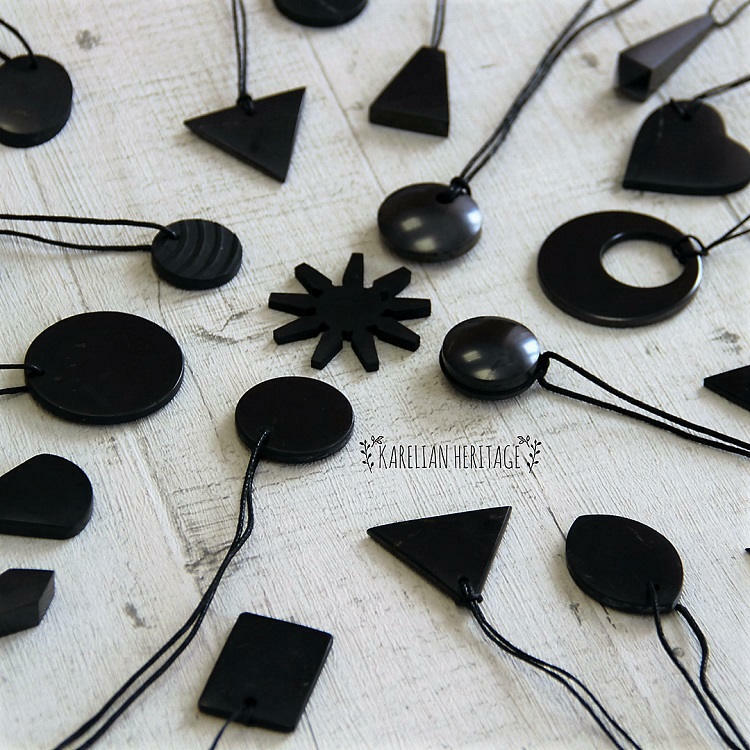 Besides, Karelian Heritage offers several shungite protective pendants sets combining the most popular and powerful pieces. It is an ideal option if you are looking where to buy shungite pendants wholesale or you would just like to protect yourself and your loved ones without extra costs. Browse through Karelian Heritage wide collection of shungite pendants carefully handcrafted by our team in order to find something in accordance with your taste to look stylish, be healthy and feel protected from any danger.